It seems like more and more famous faces are hanging in the 818. Check out who was spotted this week. Got a sighting? Contact us here! Angelina Jolie was spotted grocery shopping with two of her kids at Whole Foods on Coldwater in Sherman Oaks. Bearded Brad did not accompany. 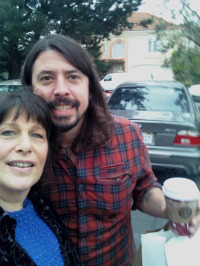 Dave Grohl (Nirvana, Foo Fighters,Them Crooked Vultures) stopped for a photo in the parking lot at the Beverly Glen Center. He seemed more than happy to have this photo taken with a fan’s cell phone. Nicole Richie at Sushi Nozawa in Studio City. Our reader said a little rice would do her good. On Golden Globe Sunday, one reader saw Modern Family’s Julie Bowen hiking Fryman Canyon in Studio City, Journey’s Steve Perry at Target in North Hollywood and Sally Kellerman at Vons in Studio City. And that was all in one morning. Britney Spears was spotted shopping solo at the Calabasas Commons. My Name is Earl’s Ethan Suplee still looked fresh after working at out 24 Hour Fitness at the Sherman Oaks Galleria. Zooey Deschanel was spotted grocery shopping at Ralphs on Coldwater and Ventura for the second time in a couple weeks. And again this week in Studio City: Miley Cyrus at the Nail Garden and Vanessa Hudgens walking on Ventura Blvd. near Vantage in Studio City.